Thomas R Miller & Son was founded by Thomas Robson Miller, a third generation German immigrant from Hanover whose family name was originally Reichmuller. TR Miller was born in Newcastle and became mayor of Morpeth and a shipowner as well as secretary to the North of England Hull Club before being invited down to London to run the UK P&I Club by the then managers, Lamplough & Co. In 1885 he took over their business and by the 1890's the UK Club was the largest such institution in the world. There is an excellent description of the early days of the firm and a photo of Thomas R Miller in 'Mutuality' - The Story of the UK P&I Club by Peter Young - on the internet. After graduating in 1967 Herry started work for Thomas Miller at the suggestion of Bill Birch Reynardson, later senior partner, who his father got to know from shooting with the Balfours. 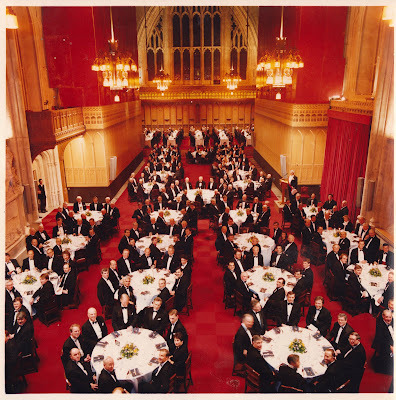 In addition to the UK P&I Club, Millers managed a number of mutual insurance clubs, including the TT Club, which insures the multimodal and logistics industry, the UK and Hellenic War Risks Clubs and the Bar Mutual, which insures the barristers in England and Wales for their PI risks. Herry worked mainly for the UK P&I Club (www.ukpandi.com) dealing with marine liability claims and handling some fascinating casualties. He travelled frequently to talk to shipowners, lawyers and correspondents - initially to Yugoslavia and India and then to the Middle East (eg Saudi, Iraq) and in time to Japan and China. In all he visited more than 50 countries, many of them regularly. Herry became a partner of Millers in 1982 and in 1984 the founding manager of a new Miller 'club' for shipbrokers, agents and managers originally called Transport Intermediaries Mutual (TIM) and following a successful merger with another Club, International Transport Intermediaries Club and had great fun helping to build that up to be the largest such insurer (of marine intermediary professional indemnity risks) in the world. He was particularly involved with the shipmanagement industry (who are also agents and intemediaries) and helped to draft the now universally accepted BIMCO SHIPMAN and CREWMAN agreements. In 1993 he moved back to the UK P&I Club while also taking various management positions in London, including Chairman of Thomas Miller (Asia Pacific). In that capacity he spent eight years commuting from London to Hong Kong, Japan, Singapore and China as well as developing the services provided by the marine clubs in London. Always interested in technology and communications, he spent time developing an on-line Encyclopaedia and also managed the UK Club's website, largely in his spare time. He also helped create an online claims recording and management system for one of the Japanese shipping lines and as well as a system for checking the pre sign-on health of seafarers. He retired in May 2006 after 39 years with Millers - but then took on a year's consultancy with a firm of City solicitors - Clyde & Co - and continued to travel in Asia. For a while he also undertook work from time to time for Thomas Miller in places like India and China, where long relationships are all-important. Click on the heading to see more photos from his time with Millers.